The tri-Ace developed, Square Enix published Star Ocean: The Last Hope was released on the Xbox 360 earlier this year. The title is not an Xbox 360 exclusive, it's coming to the PlayStation 3. 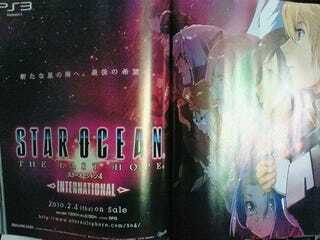 Dubbed Star Ocean: The Last Hope International, the game will be hitting the PS3 February 4, 2010 and priced at ¥8,190 (US$90). The game features reworked menu screens and a tweaked battle system with auto-targeting. SO4: International also features English and Japanese voice acting options. It really is international!